High resolution multibeam bathymetry data collected and processed by the Seafloor Mapping Lab is distributed to partners and the wider research community for use in ecological modeling, coastal conservation, baseline habitat maps, etc. The group is developing an online portal via Google Earth interface in addition to its existing direct data download capabilities. Note: The Google Maps interface may unexpectedly omit the scrollbar in the survey placemark balloons. If this tool is not available and the data list is truncated, please go directly to the SFML Map Locator [to access data tables], or open the SFML survey kml in Google Earth to download the data. Additionally, the data maps/TOC list may exceed a single page. To view all surveyed regions, click on "view catalog in larger map" and scroll to the bottom of the page for multiple page links. For each survey you may (1) download data directly from the SFML Data Library, or (2) view specific data files in Google Earth. 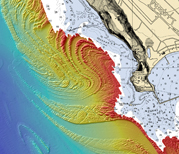 Data products include high-resolution multibeam bathymetry and backscatter imagery, generalized habitat interpretations, bathymetric soundings and contours, survey tracklines, and FGDC metadata. The data available for each region is shown on the map as survey footprint polygons (squares). Yellow squares mean the data link is not active at this time, orange squares indicate an active infromation/download link. Click on the data "blocks" for the list of data and viewing options. At this time, only multibeam bathymetry images are available in KMZ format and can be selected and viewed in Google Earth. The grayscale and depth-colored images are large files and may take time to load. - Clicking on a data block will open a download menu. When selecting a file from the menu you will be prompted to either save the file (zip or KMZ formats) or open it in Google Earth (KMZ). There may be mulitple survey locations listed within a single block. - Hint: To return to the original map(s) display select the browser Reload/Refresh icon. The creation of a high-resolution 1:24,000 scale geologic and habitat base map series covering all of California's 14,500 km2 state waters out to the 3 mile limit, and support of the state's Marine Life Protection Act Initiative (MLPA) goal to create a statewide network of Marine Protected Areas (MPAs). Map generation products follow a 3-tiered approach-- from basic survey data to highly detailed habitat classification. The need for baseline maps for monitoring & assessment was the most common requirement expressed among a very diverse list of mapping user needs.